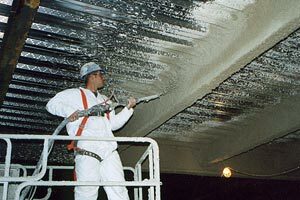 Perfect for steel structures, the spray applied fireproofing products available from Arango Insulation can help protect your building and meet fire codes. Our experienced fireproofing contractors can come to your site and apply spray fireproofing from top names like Hilti. As a family-owned and operated company, we are dedicated to providing courteous, committed service. Our technicians are highly trained to install fireproofing spray to commercial structures throughout the area. Here at Arango Insulation, we are your one-stop shop for all your fireproofing and insulation needs. No matter the size or scope of your build, you can count on us to provide you with fast, friendly, and reliable service throughout Atlanta and beyond. Contact us today if you would like more information about spray applied fireproofing, our other fireproofing or insulation products, and how we can be of service to you throughout Marietta, Kennesaw, Woodstock, Roswell, and the entire metro-Atlanta area. We also serve as a commercial roofer.